It is notorious that Beethoven was both a bad and a discontented tenant. So he was forced to move house many times. The fact that Mozart moved twelve times in Vienna alone is less well known – in this case it mirrored his changing fortunes (mostly rising until the end) and his desire to better his living conditions as well as himself. One of the greatest pleasures of Vienna for a musical tourist is the chance to visit composers' houses, to see the very rooms where they were born, composed particular famous works, or died. More than the equally interesting array of concert halls, statutes, plaques and graves, this is an intimate experience; to know that the last three Schubert sonatas were written here, Beethoven's Heiligenstadt testament and his Eroica symphony there, to see a lock of hair, a pair of spectacles, or a page in facsimile. Of course, not every place still exists; where Mozart died, there is now a department store. However, this experience has changed significantly over the last twenty years. Composers' houses used to be run-down and neglected; one had to brush the dust off the display cases. With the advent of the CD, visits became dramatically more vivid. One could put on a set of headphones, and listen to a selection of pieces composed in the room one was in. With the Mozart year 2006, one sees changes again. In Salzburg , an entirely new Mozart museum has been created from the house where he lived as a young adult, complementing the existing birthplace and stealing away many of its traditional exhibits. And in Vienna , the most famous Mozart residence, the Figaro-haus just behind the cathedral, has had the full 21st century treatment. Mozart lived here for three years, the longest period in one place in Vienna, and it represented a time, not just of Figaro, but of considerable wealth and success. 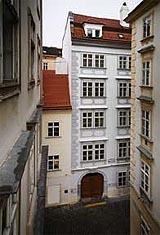 In time for 2006, the museum was expanded to three times its original size; above the Mozart-apartment, one floor describes ‘ Vienna in his time' and another ‘Mozart and musical life.' The apartment itself has a far greater emphasis on how Mozart and his household spent their everyday lives; small model figures show which people spent their time in which rooms (so the model dog appears in every room). Something is gained, but something has also been lost. This isn't the pilgrimage of visiting Mozart's house any more, it's an interactive Mozart experience. The three films one sees, a cartoon of the Vienna of Mozart's time in the entrance lobby, a visual depiction of the 13 Mozart residences with an animated magnifying glass moving over a Vienna map and a Magic flute installation that combines clips from performances and model figures- all three are quite brilliant. But when one steps in the Figaro room itself, it has ceased to be Mozart's study and turned into another room in a museum. More education, less emotion. More flute and less magic. Music is now available, not through headphones or speakers, but only on the mobile phone-like audioguide , where one is always conscious of holding it up to one's ear. As one comes out, the shop and café are quite obviously overpriced (especially as Figlmueller, serving reputedly the largest schnitzels in the world, is a minute's walk away). If this museum were a CD, it has been re-recorded as ‘crossover.' Nevertheless (or because of this) it will remain top of the ‘composer house' visitor charts in Vienna for the foreseeable future. Some unrefurbished composers' houses cannot see more than a few visitors a day; in a year, the Figarohaus is well into six figures. Whatever is wrong with the presentation, something must be right too.